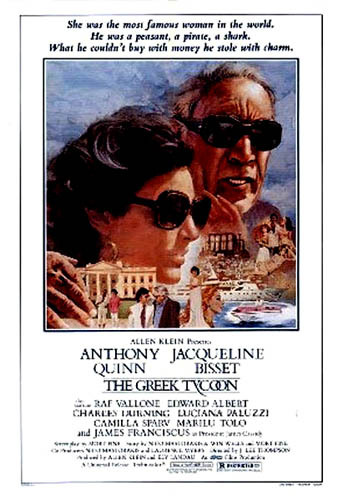 THE GREEK TYCOON - (1978) (Color) 112min: Starring: Jacqueline Bisset, Anthony Quinn, Raf Vallone. A billionaire shipping tycoon marries the widow of an American president. Loosely based on Onassis and Jackie Kennedy relationship with Quinn chewing up the scenery and Bisset underplaying her role. Shot lavishly on location with no expenses spared but nothing can save this from descending into soap opera melodrama. Worth seeing for the assortment of character actors who populate this rare version of the film.